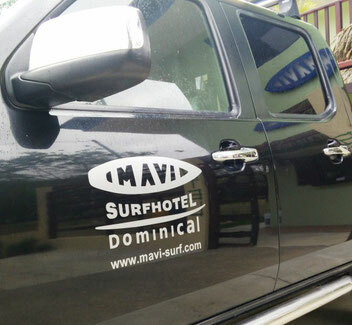 You can search for "MAVI Surf Hotel" on Google Maps, Apple Maps, or Waze. 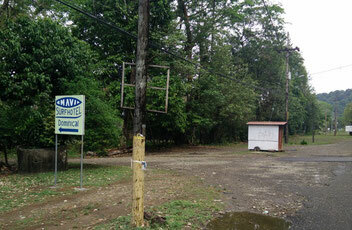 You can get to Dominical in a few different ways: by car (Van, Taxi, rented car, …) or by domestic flight and car. Whatever the case, we at MAVI will be glad to support, if needed or desired. We can arrange for you to be met at the airport (directly at San José “Juan Santamaria”, rather than Quepos “Managua” or Palmar Sur in case you elect to fly domestic) by one of our local drivers, with a spacious van or car to bring you directly to the Hotel. Just check the relevant option in the Reservation Form to know more about rates and availability. 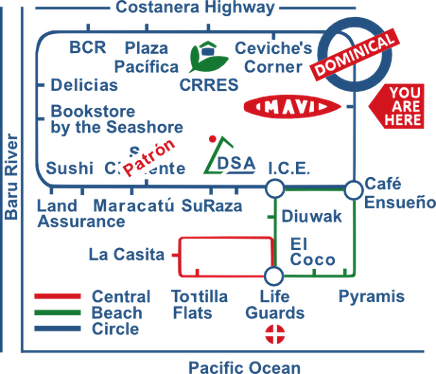 There are two major airlines that operate domestic flights to the South Pacific Coast of Costa Rica (Quepos or Palmar Sur, at some 45 minutes drive from Dominical): Sansa (www.flysansa.com) and Skyway (www.skywaycr.com). The flight takes about 45 minutes and is a wonderful opportunity to enjoy the view of the mountains and the coastline from above. 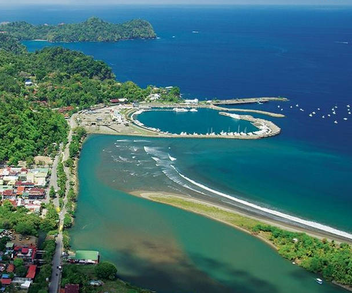 Quepos has more frequent daily connections from and to San Josè and is closer to Dominical. As both companies operate the flights with reasonably small planes, it is recommendable to check the maximum luggage allowance prior to booking the flights to avoid possible issues. 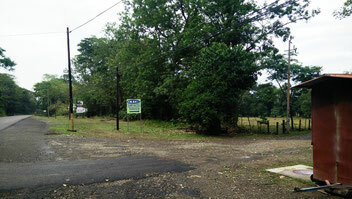 If you elect to drive from San José to Dominical, you can choose between two different routes. One (easier and faster) follows the Pacific coast along the new highways 27 and 34 past Jacò and Quepos to Dominical (it takes around 3 hours). The other follows a scenic drive along highway 2 over the mountains up to San Isidro and then to Dominical (it takes around 5 hours, and it is recommend to drive along this route only during the day and from December to March to avoid rain or fog). Once you get to Dominical, take the South entrance to town: it is 200 meters (1/10 mile) south of the Plaza Pacifica Commercial Center, on your right if you arrive from the North (Quepos - see picture above), on your left if you arrive from the South (Palmar Sur - see picture on the right), where a small Ceviche stand is located. Follow the road for some 200 meters (1/10 mile) and … welcome, you have arrived! If we have been too succinct on how to “drive yourself down to here”, please keep on reading below for additional information. By car from San Josè, along the coast. The easiest and fastest route to get to MAVI from San Josè is via Highway 27 (Josè Maria Castro Madriz) and 34 (Pacifica Fernandez). Estimated trip duration is 3 hours. From downtown San Josè get to “La Sabana” metropolitan park, and proceed towards the West along the South edge of the Park (you will get to Highway 27 toll booths really quick). From San Josè Juan Santamaria International Airport, proceed towards the West along Highway 1 (Autopista Bernardo Soto – Pan American Highway) for some 8 Kilometers (5 miles). After you will see a “Dos Pinos” (milk producer) factory on your left, exit Highway 1 on your right and turn 270 degrees to proceed towards the South along the “Radial El Coyol”. Follow the “Radial El Coyol” for some 5 Kilometers (3 miles) until you get to Highway 27. Proceed on Highway 27 towards the West following the indications to Orotina for some 50 Kilometers (35 miles) if leaving from downtown San Josè, or for some 40 Kilometers (25 miles) if leaving from Juan Santamaria Airport. Pass Ciudad Colón, Turrúcares, Atenas and Orotina, and, when you get to Orotina toll booth, follow the signs on your right indicating Highway 34 towards Jacó, leave Highway 27 and follow Highway 34 towards the South, in direction of Jacò. Some 10 Kilometers (6 miles) after leaving Highway 27 you will get to the famous “Tarcoles Bridge”, from where you can easily spot a few Costa Rica crocodiles: in case you are in mood for crocodile spotting, leave the car before or after the bridge and walk your way to the center of the bridge (be careful to remain on the – very little – sidewalk along the bridge because the traffic is not negligible … neither drivers are very careful). Keep on following Highway 34 towards the South, in direction of Jacò, Parrita and Quepos; Quepos is some 100 Kilometers (62 miles) from the moment when you left Highway 27 to get Highway 34. From Quepos, follow Highway 34 for some 40 Kilometers (25 miles) towards the South, in direction of Dominical: you will know you have reached Dominical as you cross the bridge on the Baru River (where a Police control station is located). After leaving the bridge, DO NOT take the North entrance to Dominical (on your right), go ahead for some 500 meters (1/3 mile) and, right after a small “Ceviche” kiosk, turn to your right to get the South entrance to Dominical: follow the road for some 200 meters (1/10 mile) and … welcome, you have arrived! By car from San Josè, throughout the mountains. A quite fascinating route to get to MAVI from San Josè (however NOT easy NEITHER fast) is via Highway 2 (Autopista Florencio del Castillo – Pan American Highway), the Cerro de la Muerte, and San Isidro del General. Estimated trip duration is 5 hours, and it is recommend to drive along this route only during the day and from December to March to avoid rain or fog. From downtown San Josè proceed towards the East along Highway 2 in direction of Cartago, the old Capital of Costa Rica. From San Josè Juan Santamaria International Airport, proceed towards the East along Highway 1 (Autopista Bernardo Soto – Pan American Highway) for some 16 Kilometers (10 miles) in direction of “La Sabana” metropolitan park; from here, proceed towards the East along Highway 2 in direction of Cartago. Once you reach Cartago, some 30 Kilometers (20 miles) East of La Sabana, keep on following Highway 2 in direction of Cerro de la Muerte, and San Isidro del General; San Isidro is some 100 Kilometers (60 miles) from Cartago. As you approach San Isidro, follow the signs on your right indicating Route 243 towards Dominical. Keep on following Route 243 in direction of Tinamaste, Platanillo and Dominical (some 30 Kilometers - 20 miles - from San Isidro del General): you will know you have reached Dominical as the road you are driving ends and you only have two possibilities: right towards Quepos, or left along the Bridge on the Baru River (where a Police control station is located) towards Dominical. After crossing the bridge, DO NOT take the North entrance to Dominical (on your right), go ahead for some 500 meters (1/3 mile) and, right after a small “Ceviche” kiosk, turn to your right to get the South entrance to Dominical: follow the road for some 200 meters (1/10 mile) and … welcome, you have arrived! By car from Quepos “Managua” Airport. When you leave Quepos airport, turn left and follow Highway 34 for some 40 Kilometers (25 miles) towards the South, in direction of Dominical: you will know you have reached Dominical as you cross the bridge on the Baru River (where a Police control station is located). By car from Palmar Sur Airport. When you leave Palmar´s airport, turn left toward the bridge on the Térraba River, cross the bridge and proceed towards the intersection between Highway 2 (leading to the South) and Highway 34 (leading to the North). Turn left and proceed along Highway 34 to the North, following the indications to Dominical. Pass Cortes, Coronado, Ojochal, Uvita, Playa Hermosa, and Playa Dominicalito: some 3 kilometers (2 miles) after Playa Dominicalito, before the Plaza Pacifica commercial centre (that remains on you right, jungle side), just before a small “Ceviche” kiosk, turn to your left to get the South entrance to Dominical: follow the road for some 200 meters (1/10 mile) and … welcome, you have arrived!